Apple offers a suite of subscription services, collectively called .Mac (dot-mac), which offers subscribers an excellent list of features not found anywhere else [edit: Yes, most if not all features can be cobbled together on your own, but we’re talking about a cohesive suite here]. Alas, these great features come at a hefty price ($99/year from Apple, as low as $69/yr. from Amazon), and service is spotty. Backup 3: An easy to use backup application that lets you backup files, folders and/or volumes to any media, including your iDisk. iDisk: a 1GB storage folder on a .Mac server connected to the internet, where you can save files, folders, etc. Includes a public folder where you can make downloads available to the public. iDisk is accessible from Mac or Windows. Sync: The most impressive feature of .Mac, Sync allows you to synchonize settings and information between multiple Macs. For example, I have an iMac at home and a MacBook Pro at work. All my bookmarks in Safari, email account settings, passwords, address book contacts, and calendars are sync’d between the two, making the transition between the two machines much less painful. How many times have you bookmarked something at home for work? No longer an issue. Bookmark away! One-Click iWeb Publishing: No more FTP. Just click Publish from iWeb. Photocasting: One-click publishing of photo albums, a la PodCasting. Shared Calendars: Use iCal to automatically publish and update your calendar online, which people can view with a web browser and/or subscribe and automatically import into their calendar app. For example, my wife and I both share each other’s calendar, which helps us keep track of busy kids’ schedules easily, regardless of which one of us enters in the information. Recently, Apple updated the webmail interface. In a word, the new interface is exceptional. Users of the built-in Mail.app in OS X will immediately feel at ease, as the new webmail interface matches the interface closely. 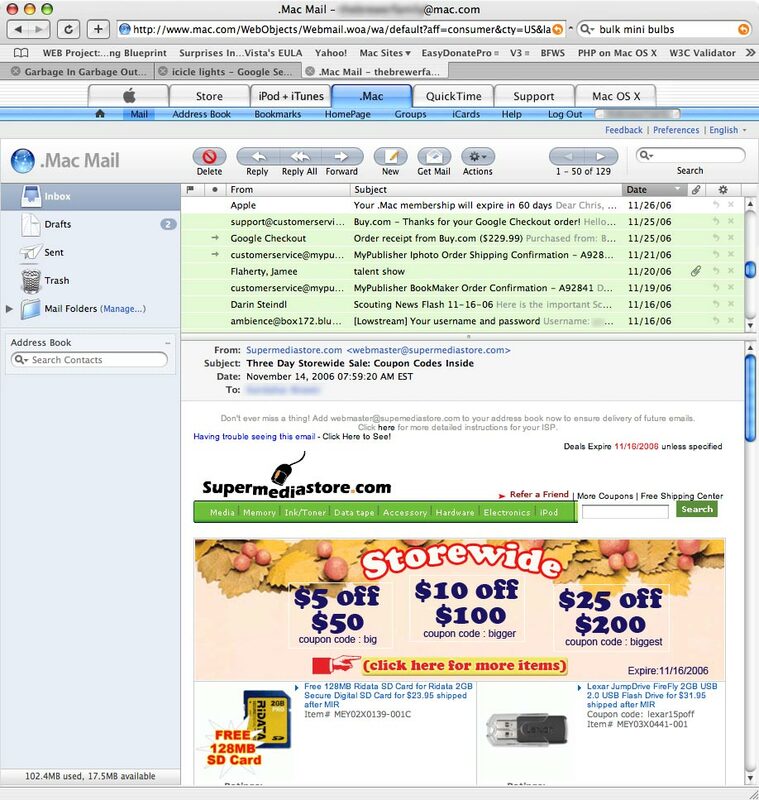 Features like autofill email addresses and spell checking blur the line between webmail’s typically clunky, uninspired interface, and the refined aspects of a stand-alone mail application. And like you’d expect, the address book from your local computer is used with webmail…regardless of which computer you’re using webmail on. Glaringly missing, though, is full address book integration; groups you’ve created in Address Book on your Mac aren’t available in webmail. That’s a serious oversight; the point of address book integration is making it all available. Further missing is a reliable server-based junk mail filter, placing the onus of filtering junk on the Mail.app program. And now, on to the meat of this story. Dot-Mac represents the hope of half a million Macintosh users (representing $34.5 million in revenue for Apple, mind you) for streamlined, simple access to a valuable set of features. It comes close to nailing the experience, yet in a very un-Mac like way, it lets the user down, inevitably disappointing them at one time or another. Sync, while working 95% of the time, can suffer from a maddening series of circular references, where contact data changed on one machine doesn’t want to stick on another. Well, I’m sorry to say, Apple, that it is good enough. Good enough to keep me subscribing, and just bad enough to keep me looking for a replacement. To remind Apple that someone, somewhere is working on a replacement is misguided, because the truth of the matter is that I’m not whining about needing a better feature set; I just want dot-Mac to work reliably. And that, my friends, is much easier to accomplish than you might think. It starts with admitting there’s a problem, and ends with a commitment to customers from Apple. This entry was posted in Consumer Activism, Front Page, Technology by Chris Brewer. Bookmark the permalink. I agree…I bought a .Mac account back in ’03 (12″ iBook *sniff, sniff*), and it was utterly underwhelming and woefully overpriced. Email address? don’t need another one. Viral protection? Isn’t a big selling platform for Macs the need to NOT have viral protection…something’s rotten in denmark. One click publising? Seriously, that’s user friendly..something that should be built into the OS…especically considering that all prevalent modern OS’s have FTP built in…come on, make it easy to use!! Photocasting? Want podcasting to catch on? Want people to use itunes to download…get them hooked? Then make it easy (and free!) to publish photocasts. Shared Calendars? One of my favorite features (Famous Birthdays, DVD Releases, Book Releases, etc)…but come on..another feature that should be free. Seems to me that Apple is trying to squeeze more revenue off a few decent ideas that should have been integrated into the OS in the first place, but then again, WTF do I know.